The holidays are upon us! As the fall semester winds down, I hope you will have the opportunity to reflect on the things for which you are grateful. I would like to start my first newsletter thanking all our members for the work that you do to serve your campus communities. Like most of you, I feel so blessed to be able to work with students and watch them grow intellectually, socially and culturally. I am also thankful for our growth and progress of our association. We have reached numerous milestones in recent years, celebrating our 90th anniversary, record membership growth, record conference attendance and sponsorship dollars raised. Our Strategic Plan guides our association and sets the vision for our bright future. As we are on track to wrap up the strategic plan, it is time to prepare for a new plan that will set priorities, focus our energy and resources, strengthen operations and ensure we are working toward a common vision. In order prepare for the next plan we need input from the membership. To accomplish this, we will be assessing your educational and career development needs. Your participation is important so be on the lookout for the survey coming this month. The TACUPSA Board is recruiting members to serve the organization in various capacities. Our Association is built upon the strength and talents of our members so I encourage you to participate in committees. These opportunities are open to anyone who would like to volunteer and help the association while developing your professional development. You will get out of a committee what you are putting into it. If you are interested in serving, we will be sending out a list of opportunities in early January. If you have an idea for a committee or volunteer opportunity contact Stephanie Box, Director for Memberships Stephanie.Box@tamucc.edu. We would love to hear from you. I would like to give a special shout out to all our first time conference attendees! The Board and I are excited to have so many professionals join our association. 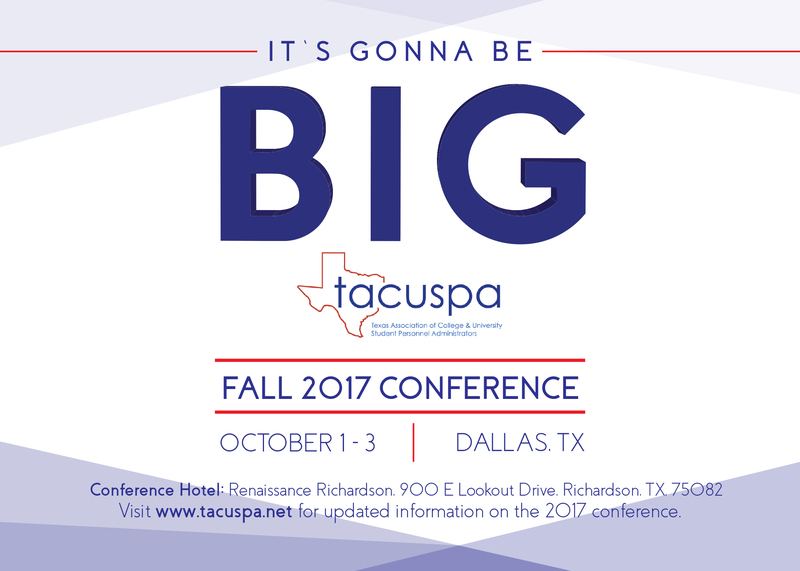 So welcome to TACUSPA and we hope to you see along with everyone else in Dallas October 1-3, 2017! Individual members can renew online at https://tacuspa.wildapricot.org/individual. 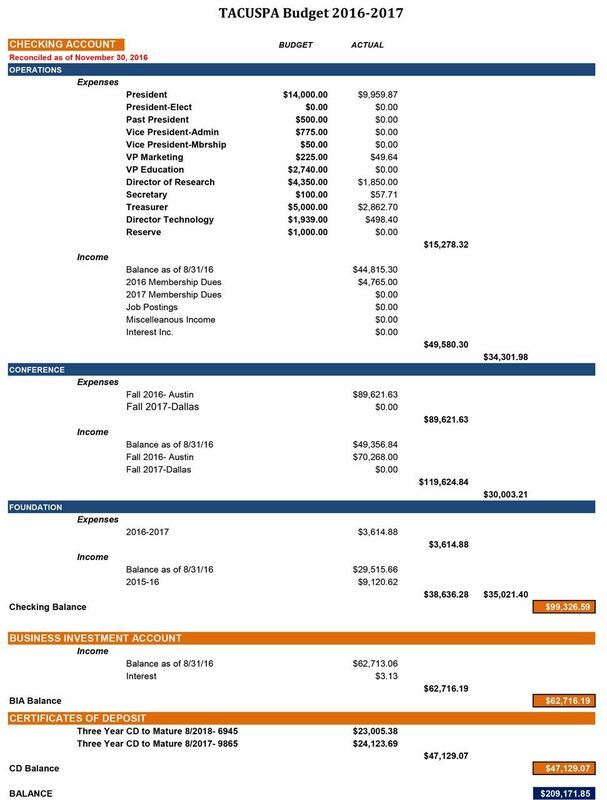 Reminder: student members cannot be full time employees at a college or university AND they must be full time students. Verification of full time student status may be requested from a student member. It has been a busy and productive year for our association. Together we have achieved many accomplishments. I was honored to serve alongside some of the hardest working and more dedicated professionals in our state. This has been a record-breaking year. At the time of our conference in October, our membership stood at 711 members, surpassing last year’s all-time high of 662 members. We had 13 individuals on the ballot for our annual election last May and a total of 127 members voted in the election. Donations to the foundation continue to grow and our overall assets for TACUSPA are strong. We have so many other things to be proud of this year, including a successful conference. This year’s conference set a few new benchmarks, including our highest attendance ever at 341 attendees. We also set a new record for sponsorship with more than $15,000. We were able to create a partnership with Campus Labs to expand our assessment activities beyond the fall conference to help us assess other learning programs, seek feedback from and assess the needs of our members. We’ve continued to provide excellent professional development through our webinar series and so much more! 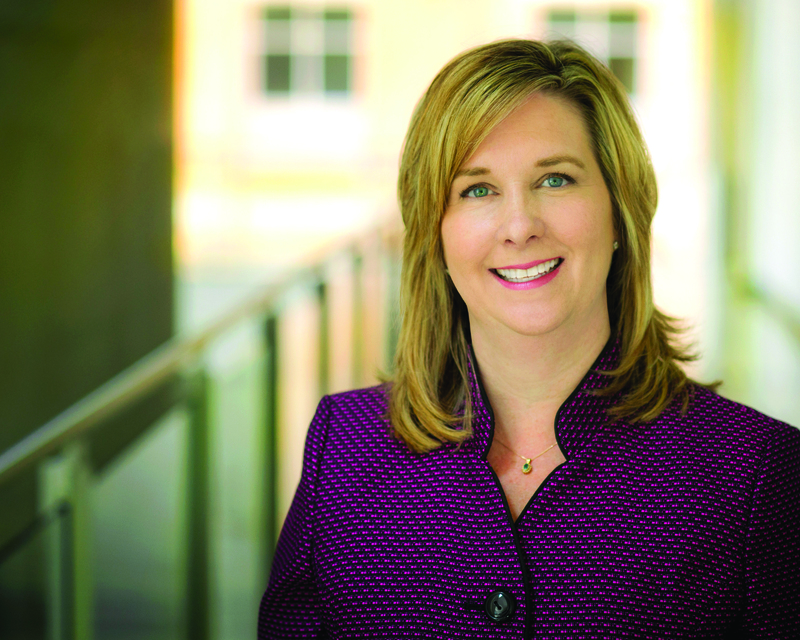 Heather Snow currently serves as the Dean of Students at UT Arlington where she has worked since 2008. She has been a member of TACUSPA since arriving in Texas 8 1/2 years ago and has served the association as Awards and Recognition Chair, conference presenter, keynote/program chair, a conference committee member, and Vice President for Administration. This year Heather will be co-chairing the 2017 TACUSPA conference with Trisha VanDuser. Heather is the Mom to two beautiful girls (Lily (9) and Charlotte (6) and is in the dissertation phase of her PhD program at UTA. Now that the annual conference is over and our semester’s work is wrapping up, all eyes are on the goals for the spring semester and beyond. The Assessment and Evaluation Community of Practice is looking for regular contributors to tell their story about how they put assessment into action and best practices that we can share across the state. If you are interested in sharing your story please reach out to the Director of Assessment for TACUSPA (Pam Shefman, pshefman@central.uh.edu). Also, do not be surprised if she reaches out to you to help contribute to the Assessment in Action Corner! The 2016 TACUSPA Fall Annual Conference, “Picturing Our Future, Telling Our Story” was held in Austin October 23-25 at the AT&T Executive Education and Conference Center and had a record setting 325 conference attendees. This year’s conference hosted the first Mid-Manager’s Institute, provided educational sessions tracks that allowed attendees to maximize their learning and development, and hosted a Communities of Practice Open House to encourage association involvement among membership. TACUSPA also welcomed fellow higher education associations, including the Texas Association of Chicanos in Higher Education, ACPA-College Student Educators International, and NASPA-Texas. The conference continued its partnership with the Texas chapter of the Association for Student Conduct Administration to feature an education session track on topics relating to student conduct and discipline, institutional policy, and Title IX compliance. ASCA-TX also held its annual state meeting during the conference. Gerardo Altamirano, Texas State University, was recognized as Outstanding New Professional. Christine Self, Texas Tech University, was recognized as Outstanding Mid-Level Professional. Dr. Clint-Michael Reneau, Texas State University, was recognized for Dissertation of the Year. Dr. Uyen Tran-Parsons, University of North Texas, was recognized as Faculty Member of the Year. The Distinguished Service (Jim Caswell) Award was presented to Dr. Keri Rogers. Thanks to everyone who supported the TACUSPA Foundation this year! We have raised $7,733 so far and for those that we may have missed at the conference, it’s not too late to donate for 2016. Simply click on this link and make your donation: http://tacuspa.net/Donation_Sponsorships. We had several new initiatives this year and we appreciate everyone who participated in the Tea Pot challenge, Century Club campaign, bidding on the 5th line frenzy and purchasing mystery boxes. Donations to the Foundation included: Cash Donations = $5,085; Silent Auction = $2,398; Golf Tournament = $250. We are especially grateful for those who made donations to the silent auction. The TACUSPA Foundation is proud to support the Thomas Moorman Fellowship Program and Graduate Student scholarships. Better understanding students, their needs and their behaviors is vital as institutions seek to increase persistence and success. Leveraging peer mentor observation and feedback related to retention factors can help institutions make decisions that impact students on an individual or group level. Examine how Tarleton State University created a Resident Success Profile to better understand student behavior. Identify ways the Resident Success Profile was used to make decisions on Tarleton’s campus. Through round table discussion, explore available technology to capture peer observations on your campus. Dr. Scott Lewis, Title IX Expert, Partner with NCHERM Group, and Advisory Board Member of ATIXA. Wednesday, March 8, 2017, 12:00-1:00pm: Stop. Collaborate. And Prevent. Prevention is a campus-wide initiative. The presentation will focus on how a small to medium size university collaborates to address violence prevention. Students are coming to college with a need to belong but don’t always trust and connect with the staff tasked to get them involved. Also, students often don’t see us as very much like them. This makes connecting very difficult. It isn’t their job to feel like they belong, it is our job to get them involved so they feel like they belong. Telling our stories is a great way to connect and develop personal trusting relationships with students. Come learn why you need to make this a priority to develop a sense of belonging and mattering with your students. The Relationship Violence and Sexual Assault Prevention (RVSP) Program at UT Arlington provides education, support, and advocacy to the UT Arlington campus community. Join us on a journey of the evolution of case management since the department was founded in 2007 to present time. We will discuss available services, process, challenges, and the practice of social work in a high education setting. Moral disengagement and assumption-making can quicken the process by which individuals excuse themselves from relational connection and commit atrocity. In this session, presenters will apply theories from leadership and social psychology to shift the conversation on violence against the LGBT community to actions that university leaders and mentors may adopt that have documented, morally engaging effects. The TACUSPA webinar series is one of many professional development opportunities provided to our members and is sponsored by Campus Labs.